As a professional voiceover artist and impressionist, one style of I get asked to deliver regularly is a sports commentator. I’ve played football commentators for a wide selection of adverts on TV and radio, including the 118 118 TV adverts, which were a lot of fun to voice! 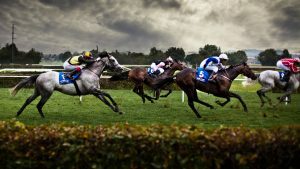 Another style that’s a lot of fun to deliver is a horse racing commentator voice. When you think of a horse racing commentator, if you’re of a certain age then you’ll remember the commentaries of the late great Peter O’Sullevan, or Irishman Des Scahill. They started off at a slow and relaxed pace, setting the scene and describing the early stages of the race. When the race gathered steam and neared it’s climax, so did their voices! They grew more and more excited and animated until the horses reached the finishing line, when they were at their fever pitch; often yelling at the top of their voices, creating the most incredible excitement and tension until the race was over and the victorious horse had won. Here’s an example of my horse acing commentator, in the style of Peter O’Sullevan. And an in-store advert for ASDA supermarkets, advertising Cadburys chocolates. If you require a horse racing commentator, then I’ll be happy to help. This is just one style I am able to deliver. If you require a more natural tone, then of course I’ll be happy to tailor my delivery to suit your needs. Please get in touch and let me know what you require.